Young adults who are considering furthering their high school education by continuing on to college may not be able to afford the ever increasing costs of college. Families with multiple children going off to college may not be able to afford the multiple tuition costs and expenses. Financial aid is available for those who are in need and who qualify. There are a variety of options to help the potential college student: grants, student loans, work study programs, and scholarships. These programs may be funded from the federal government, from the state government, from the college university directly, or even from private companies or corporations. What is the difference between these types of financial aid? The main difference is whether or not the funds have to be repaid, as explained below. Another difference comes from the source of the funding, along with the requirements to qualify for the different programs. These are funds that typically come from a non-profit company, such as the federal government. Grants may be given for a specific project and do not need to be paid back. The recipient will most likely have to provide updates and reports regarding the specified project. Grants are not aimed solely towards the expense of a college education but may span a variety of topics and interests. Like grants, these funds do not need to be paid back. There are a broad range of scholarships, ranging from athletic scholarships to need based scholarships to academic scholarships. 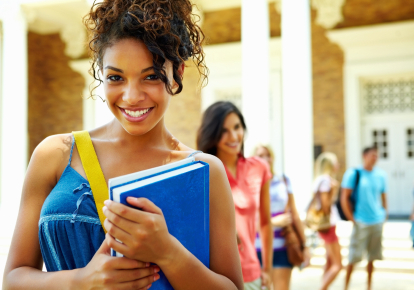 Scholarships are specifically geared towards helping students finance their college education. Typically, requirements are more strict than other forms of financial aid and may vary from scholarship types. For instance, academic scholarships may require a high level of academic excellence, while a need based scholarship focuses more on the financial eligibility of the student and his or her family. These are funds that are borrowed directly by the student and will have to be paid back at a later date. Typically there is a grace period that allows the student to complete their four year education before starting to pay back the loan. The U.S. Department of Education is one such provider of student loans. Listed below are just a few programs available for today’s student, specifically those seeking undergraduate studies. Federal Pell Grants, Federal Supplemental Educational Opportunity Grants (FSEOG), Federal Work-Study (FWS), and Federal Perkins Loan programs are just a few programs offered by the federal government. The first three programs are actually administered by the colleges and universities directly and the availability of funds will vary with each individual educational institution. The maximum grant amount is $5,550. Grant amounts vary from $100 to $4,000 a year, depending on the individual student’s financial need. This program offers employment opportunities for students to help contribute to their own education. These jobs are typically part-time and located on the college campus and are limited in number. These low interest loans are made directly through the school to the student. Maximum loan amount is around $5,500 per undergraduate year with a maximum of $27,500 total. There is typically a nine month grace period after graduation before repayments begin. Repayment may even be delayed if post-graduate studies are pursued. To apply for any federal grant, the Free Application for Federal Student Aid (FAFSA) is used. This one application automatically applies the student to all the various federal programs. Teacher Education Assistance for College and Higher Education Grant (TEACH Grant) – Grant amounts are offered up to $4,000 per year for students pursuing a teaching degree. However, there are post graduate requirements that need to be met. Recipients agree to teach in a high-need area serving schools with low -income students. The Academic Competitiveness Grant (ACG) – Qualifying applicants include first and second year undergraduate students only. Grant amounts range from $750 for the first year to $1,300 for the second year. One requirement is for the applicant to have completed a “rigorous secondary school program of study” as defined by U.S. Department of Education. This may include such items as advanced or honors programs or Advanced Placement (AP) courses with a a minimum score requirement on the corresponding College Board’s exams. The National Science & Mathematics Access to Retain Talent Grant (National SMART Grant) – This grant provides a maximum of $4,000 per year for undergraduate students during the third and fourth year of study. One requirement for this aid is a major in the field of science or math, including such areas as technology, engineering and computer science. Due to the current shortage of health care professionals, the U.S. Department of Health and Human Services offers a variety of financial aid for those seeking an education in the field of nursing and other health care professions. Loan Programs – Includes the Health Professions Student Loans, which is a need based loan for those interested in and pursuing a degree in such health profession fields as dentistry or optometry. Pharmacy, podiatry and even veterinary medicine is also included. Includes the Nursing Education Loan Repayment Program, where nurses may receive up to 60% of their nursing education loan in exchange for 2 years of service. With the National Health Services Corps program, recipients may receive funds for up to 4 years in exchange for a specified number of years of service at an approved location, typically one in a high-need area or in an understaffed facility. Funds may be used to cover tuition and may also be used for a living expenses stipend. For more information on these programs, please visit: Hrsa.Gov. The Montgomery G.I. Bill (MGIB) is a government program that requires enlisting in the military service for a specific time period to receive educational benefits after the service is completed. An individual can enlist in all areas of the military, such as the Army or Navy or Coast Guard. Becoming a reservist or even joining the National Guard may also qualify you for some financial aid. While an active service member, you may have to contribute a portion of your pay to this program. ROTC offers tuition assistance for those interested in training to become an officer in the various military branches like the Navy, Air Force, and Army. These scholarships may cover the full costs of tuition, along with any school related fees and even a textbook and monthly living expenses stipend. Each state government may offer their own specific education grants. For example, American Indian students in Wisconsin may qualify for a Wisconsin specific educational grant. The state of Florida offers the Bright Futures Scholarship Program. Check with your individual state government for any state specific educational grants or scholarship programs that they may offer. States may also offer a discounted tuition rate for residents of their state if they attend a state university or college. For example, Cornell University, an Ivy League university located in Ithaca, New York, offers an estimated $15,000 savings in tuition costs and fees for New York residents attending their state portion or “Contract” Colleges within the university. For more information on financial aid programs by state, please visit: the government’s website. Other Scholarships are also available from the individual university or from a variety of private companies and corporations. A few are listed below. Universities typically recruit athletes who show a high level of skill in a specific sport and may offer an athletic scholarship. This may cover tuition and even including a stipend for living expenses. These vary greatly by universities and one should consult the university directly for more information. For more information about this program, please visit: BodyByMilk.Com. Qualified applicants located in Chicago, Illinois who have participated in an Olympic or Paralympic sport in the last three years are eligible. These WSC scholars will also be eligible to compete for a limited number of college scholarship supported by the MacArthur Foundation, receiving up to $10,000 per year for a maximum of $40,000 total. For more information about this program, please visit: World Sport Chicago. The National Merit Scholarship Program is a scholarship program administered by the National Merit Scholarship Corporation (NMSC), which is a private non-profit organization. Corporate sponsors work together with NMSC to award thousands of scholarships, which vary in the amount and requirements for each type of scholarship. Some recipients may be required to be related to an employee of the corporate sponsor. Other recipients may be required to pursue a specific major or career field in order to qualify. College sponsored merit awards are based on attending the specified sponsor college. Preliminary SAT/National Merit Scholarship Qualifying Test (PSAT/NMSQT) scores are used as the initial screening process for this scholarship program. The National Achievement Scholarship Program is a specific program in which only African American students participate. For more information about this program, please visit: National Merit’s website. The Coca-Cola Scholars Foundation offers 250 academic scholarships and is achievement-based. The lengthly application process can result in a scholarship in the amount of $2,500 to $5,000 per year for a total of $10,000 to $20,000. However, applicants cannot be children of any employee or anyone associated with the Coca-Cola company and subsidiaries. For more information about this program, please visit: Coca-Cola’s website. The KFC Colonel’s Scholars Program offers a scholarship for applicants up to $5,000 per year, with a potential up to $20,000 over four years. The funds can be used towards tuition, fees, books, and room and board. The ability to demonstrate financial needs is only one requirement for this scholarship. For more information about this program, please visit: KFC’s website. A regional supermarket chain started in 1916 in Rochester, New York, Wegmans currently has over 75 stores in the Northeastern part of the United States. The Wegmans Employee Scholarship Program is available for those part-time and full-time employees who qualify. Applicants may receive $1,500-$2,200 per year for 4 years, for a total of $6,000 to $8,800. A minimum number of hours worked is required to continue to be eligible after the first year. For more information about this program, please visit: Wegman’s website. As can be seen from all the various programs described above, there are plenty of options for the student in financial need. There are many programs available that may not be listed here, but this provides a start for the college-bound student seeking financial help. I am looking for more help for my education as now I am going to a online art school and Iwould love to continue to finish. I need any help that I can get and I have some federal loans but they are going to become way too much by the end of my education. Please help me!!!!! Hi. My name is Tommy and i’m in my junior year at college. My Major is International Business and i’m trying to avoid student loans. Is there anything that could get me through my last year and a half? I am going back to college in my mid 30’s, I am on my own and don’t want to pay back to much in student loans. Is there any possible way to get grants or work-study at my age? I am freshman in college with a GPA of 3.7 and I really need need need need need financial help, so that I can further my education. Please forward me any information on grants and other resources to help me network my future. I am 34 years old and I am going to college in pursuit of a BA in Psychology, Masters in Social Work and a PHD in Family and Child Counseling. I have been a preschool teacher since 1996 and would like to further my career to help children and families dealing with difficulities, trauma and addiction. If there are any grants, scholarships or fellowships available to help with this goal, I would really appreciate the help. I will be going to school full-time and will no longer be a full-time employee so any help I can get will be SOOOOOO rewarding. I am John Michael M. Fernandez, 16 years old of age, a resident of Conel General santos city PHILIPPINES and a indigenous people . I’m longing for a financial assistance so that i may able to continue my study in college level with the course of BACHELOR OF ELEMENTARY EDUCATION.. Please let me avail in this scholarship programme i am so much hoping your concern and help.. Thank you and God bless.. I am 43 years old and I want to go back to school to be a C N A, is there any grant that can help me. Thank you. Please be careful with Penn Foster. YES they are accredited, but they are NATIONALLY accredited. This means, your degree will count for career purposes, but if you decide to roll over your degree into another program (that is not in their school) your credits may not transfer. In other words, if you get your BA/BS there and want to go into an MA program elsewhere, if that program doesn’t accept nationally accredited credits, you’ll have to take your BA/BS over again. Think of them as a career school, not a higher ed school and you’ll be fine. I want to go to school for Sound Engineering. I have received federal loan and grants, but still need a $3000 down payment to get into the school of my choice. I would appreciate any help or leads. Thanks. Hi i have a 18 year old son who wants to go to a private Sound Engineering school of his choice cost is 8400.00 i am a low income single mom with a disabilty so i cant work or afford to take out a loan to help him! he also has been having a very hard time trying to find a job because he is a fulltime student at a community college and can only do partime work are there any grants or funding that can help us! because we need all the help we can get. i am a proud mom who loves her son and i want to see his dream come true. I am a junior first semester transfer student at Western New England University. I currently still have a balance on my tuition, which is making me ineligible to register for the Fall 2013 semester. I only need $4000.00 USD in order to pay off this semester but I am unable to take out any other loans due to my lack of income and no eligible co-signer. Please point me in the right direction to continue my education. I don’t want to be a college drop out due to insufficient funds. I have honorable to submit my application concerned the above mentioned subjects. I’m Tanzania national, born in Zanzibar Island in 11 January 1975. I was completed to study Advanced Certificate Education in 1995 at Lumumba Secondary Education in Tanzania. And I had opportunity to study Postgraduate in Tax Management and I studied several Computer courses in different professions that I believe you will help me. I would like you to beg to help me in accommodation fees and ticket from home to Malaysia at SEGi University in Malaysia, but the tuition fees I will pay myself, because I can’t afford to pay all fees by myself, and all support documents I sent to you, just open the attachments at see the details of University. I hope you will reply me very soon, if you accept my application. P.O. Box 2552, Zanzibar Island. I am a foreign student in a school in Malaysia and I have one year left I can’t afford my tuition and would like to know what grants or financial aid, I can receive to complete my studies. Please help I am in need. Can someone give me legitimate sites or help with this. I had to sit out but all I need is the tuition money to finish my last classes to graduate. Hi, my name is Liston Felix Kosimbo, a Kenyan, 16 years of age turning 17 next year, i am in high school Year 10 (IGCSE) i have a problem when it comes to school fees although my parents have tried their best to do what they can, but sometimes they cannot meet the required fee structure, so i thought of going online to search for High School educational grants or scholarships and that’s when i found the African Leadership Academy which i was so exited to read about. So i was humbly requesting if the African Leadership Academy could assist me, i would really be grateful and I’d really appreciate.. Thank you and I’m looking forward to hearing from you soon.. There a few things that I believe make me an ideal candidate for a grant or scholarship. I am pursuing my dream of becoming an aerospace engineer to work on and create aircraft. In order to do such, I have to complete a bachelors program at an accredited college or university in that field of science/engineering. I am currently chasing that goal by attending Hill College in Cleburne, TX. I am doing this because Hill college is the only school I can afford at the time. My mother raised me and my four siblings on her own until I was 16 and she doesn’t have any money to put towards my education. My father on the other hand is a retired Marine. When I was in high school, the Marine Corps tried to make him move out of state, when he had just came truly into my life and was stationed within 30 minutes of my school. So, he told them no and they forced him to retire. Because of such a quick retirement forced upon him, he wasn’t able to sign the GI bill over to me, and they will not let him do it now. Therefore, he also does not have money to put towards my education. So, since my graduation, I have been working strenuously, at times having three jobs just to afford rent, car payments, and living costs as well as tuition for school. I currently work on train cars in Cleburne so that I can try to get as much hands on as possible in the mechanical field. Unfortunately, this job doesn’t pay enough to put me though UT Arlington’s schooling. On the other hand, I work 12 hour days and it is very hard for me to keep up with school work when I am so tired from work everyday. Through all of this that I have stated above, I still am able to maintain my 3.8 GPA as well as succeed at work to my fullest potential. In my opinion, this shows that I am a very hard worker and that I have a goal and I will reach that goal regardless of what it takes. I feel that this makes me a perfect candidate for a grant or scholarship, because you will know that with me, your funding will not go to waste. It will give the world another bright and ambitious engineer. If I received your funding, I would not have to work such a difficult and time consuming job and I would be able to crack down hard on school and promise you a 3.5 GPA or higher. Senior working on my BS need funds for my last semester. I am 38 years old, from South Sudan, looking for well-wishers who can manage to fund my degree program in Procurement and logistics, as I didn’t afford it myself to finish my studies since I have been accepted by different institutions, like Khartoum, Juba and The Bridge University, but failed to continue due to lack of grant fund. My name is Mr. Alamin Drani Martin and I am writing in an application for a scholarship to assist me throughout my time studying in ACCA program at London School of Business & Finance-LSBF. I Choose London School of Business & Finance; because the school cultivates an ethos in which I can learn, grow, and succeed. I will be able to share ideas and experiences with people from all over the world as I shape my future success. LSBF is diverse and standard with students from many countries studying with them, the school campuses, courses and classrooms also offer a truly global, diverse and enriching experience. LSBF is the perfect place to gain a truly international experience, preparing me for today’s global marketplace. Despite financial hardship I have always done what is necessary to further my studies and work experience. This includes six months shorts contracts work with national non-governmental organization here in South Sudan in serving the communities as well as two solid years of balancing work alongside my study commitments in order to be able to pay the very considerable fees required to study Finance & Accounting. This scholarship represents to me an opportunity to fully focus my attention on the main objective of achieving the best I can in ACCA program. I will strive to be a representative and ambassador of University of Denver throughout my future career and am very thankful to be able to attend this course. I am grateful to find opportunities like the one that your foundation is providing to students like me who are constantly fighting for the right to receive an education. I remain persistent and will keep working hard until I reach my career goals. I am hopeful to become one of your foundation’s scholarship recipients, so that I can continue on my pathway to become an Accountant.